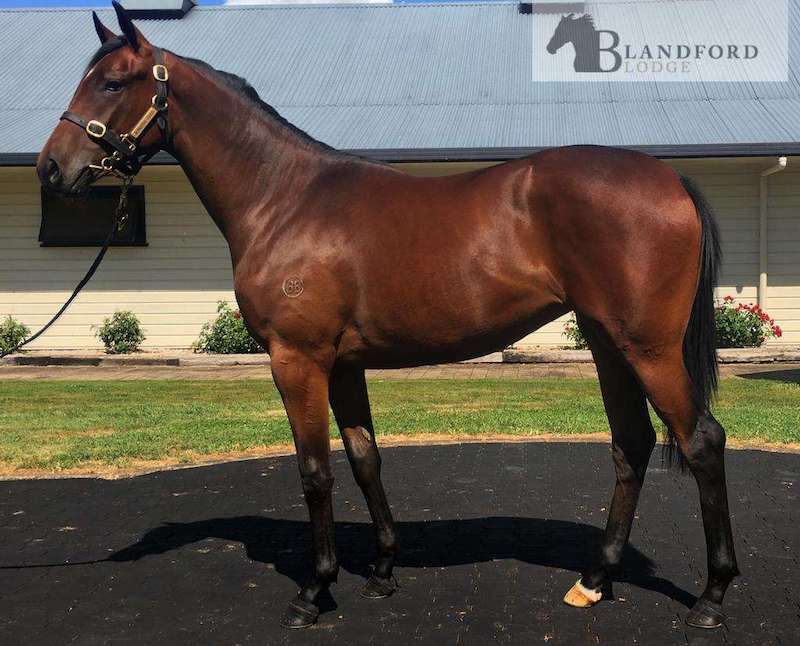 By the same Makfi/Zabeel cross that has already produced Makfi’s best performed daughter in Bonneval, this lovely New Zealand bred filly will be trained by Trent Busuttin and Natalie Young. The dam is a young broodmare who has thrown everything into this good sized filly – in fact Makfi’s top 5 performed offspring 4 of them have been fillies. She is spelling for a month and will be broken in and educated in NZ. There will be no hurry to bring her back to Australia in the short term so she can enjoy the amazing NZ pastures and be given plenty of time to mature. MAKFI (GB) (Bay 2007-Stud 2011). 4 wins-1 at 2, The Two Thousand Guineas, Gr.1. Sire of 497 rnrs, 307 wnrs, 26 SW, inc. Bonneval (New Zealand Oaks, Gr.1), Make Believe, Sofia Rosa, Marky Mark, Noor Al Hawa, Fabricate, Maimara, Eleonora, Imposing Lass, Run Naan - Shining Gem (H.K. ), Matchbreaker - Monster Kaka (H.K. ), Mate Story, Magic Circle, Cornwallville, Pappalino, Monroe Bay, Titi Makfi, Not Only Florina, Savile Row, Tribal Wisdom, etc. SAVANITE, by Savabeel. Winner at 1300m in NZ. Half-sister to SINGING STAR (dam of MISS SELBY), Brave Flyer, Written by a Queen, Yeah Nah (dam of VIADANA, INDECISION). This is her second foal. Her first foal is a 2YO. INDECISION (Per Incanto). 6 wins-1 at 2-at 800m, 1200m, NZ$158,525, to 2018-19, ARC Hallmark Stud H., L, Hawkes Bay Finance Sprint H., L, Waikato RC Sprint H., L, Avondale JC NZB Insurance Pearl Series H., 2d Rotorua RC Arawa S., Gr.3, Hawkes Bay LI Redshaw Memorial H., Matamata RC NZB Insurance Pearl Series H., Rotorua RC NZB Insurance Pearl Series H., 3d BOP RC NZB Insurance Pearl Series H.
Joure la Partie (Gielgud). 7 wins to 1500m, VRC Scomeld H., SAJC Unconquered H., Lady Nurmi H., T Lewis H., 3YO H., 3d VATC Jewel H., L. Producer. SECOND EFFORT (Mossman). 11 wins to 1400m, A$680,703, MRC PB Lawrence S., Gr.2, Bletchingly S., Gr.3, Warrnambool RC Wangoom H., L-twice, MRC Zaidee's Rainbow Shoelaces H., Le Pine Funerals Cup, MVRC Cafetto Sprint H., 3d MRC PB Lawrence S., Gr.2, Memsie S., Gr.2, VRC Chester Manifold S., L, MRC Sir John Monash S., L.
Deautche Express (Volksraad). 3 wins-1 at 2-at 1200m, 1400m, Hawkes Bay Robbie Burns Stortford Lodge H., Waikato RC United Cleaning Services 3YO S., 3d Avondale JC 2YO Fillies S., L, 4th Hawkes Bay Highview S., Gr.3. Producer. HELLBENT (I Am Invincible). 7 wins-1 at 2-to 1200m, A$901,450, to 2017-18, MVRC William Reid S., Gr.1, VRC Inglis Dash, MRC Mypunter.com H., ATC McGrath Estate Agents 2YO P., Ranvet H., MRC Toronado at Swettenham H., 2d MVRC William Reid S., Gr.1, 3d MRC Oakleigh P., Gr.1, ATC Hall Mark S., Gr.3, VRC Mumm S., L, Kensington S., L, City Tatt's RC Brian Crowley S., L, 4th MRC Oakleigh P., Gr.1, Schillaci S., Gr.2.